Why don’t we do all our acquisition programs faster? What keeps us from having all acquisition programs be “rapid” acquisitions? The short answer is that, if we choose to, we can trade quality for time. Sometimes that is smart, and sometimes it isn’t. Often, and for good reasons, we demand high quality, and that takes more time. What I mean by “quality” in this case is the suite of features we want in the equipment intended for a large fraction of the force and that we keep in our inventory for a long time — 30 or 40 years, in many cases. Quality includes high reliability, maintainability, operation in a range of climates and terrains, modularity and upgradability, well-designed user interfaces, cybersecurity, robustness against responsive threats, and effective training and logistics systems. None of these things is free, and they all take time to design for and test. For most so-called Programs of Record, we do take the time to design and build products of the quality desired by the customers, our operational communities. If you want something quick, it is generally going to be of lower quality — but that may be perfectly fine, depending on what you want. This is the operator’s call; the acquisition system responds to operator requirements. As acquisition professionals, we do want a two-way continuing discussion about requirements throughout the design and development process — and beyond. That conversation is necessary because design and development always involve a voyage of discovery. And because many desired design features have to be traded off against each other and against cost, those trade-offs should be operator/customer decisions, but should still be decisions informed by acquisition professionals. To do anything, we need money and a contract. There are vehicles that let us spend some money quickly, particularly for early stage prototypes, and there are some contract types that allow us to move out quickly, but they have limitations on scope, purpose, and amount we can spend. Lead time can be close to zero, or up to 2 years if we have to wait for a budget to be prepared, submitted and funded by Congress. 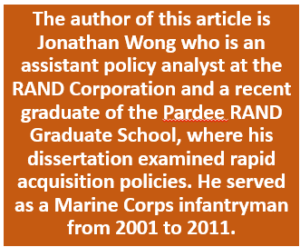 We can work contracting activities (preparation of the request for proposal or even source selection) and milestone review processes (Defense Acquisition Board document preparation, as required) in parallel with the process of getting money — and usually we do so. If we already have the money, then some time is needed to have a contract. Again, for some limited purposes, this can be fast — but for major competitive awards this now takes about 18 months, close to the time it takes us to get funding from Congress. That’s twice the time it used to take a couple of decades ago, and one of the actions we are working is to reduce this lead time. If we just want a small number of prototypes for experimental purposes, and we only care about some key features and not the overall quality of the product, we can deliver in a matter of months or a few years, depending on how much new design work has to be done and the lead time for building small numbers of items or acquiring any needed subsystems from the manufacturers in the supply chain. If we want to try out a new kind of capability, to experiment, and don’t care about long-term ownership quality quality-related features, then rapid prototyping is the way to go. We can do this sort of thing fast, and the technical community loves to work on projects like this. However, some quality aspects such as safety must be dealt with when we work with energetics such as munitions and rocket propellants. We can do experimental prototyping without having a program of record, so no acquisition system bureaucracy overhead need be involved in an experimental prototype program. The product you will get from an experimental prototyping program is unlikely to be one you can just replicate and field in large numbers—it wasn’t designed for that. Sometimes we have liked the key features of experimental prototypes and just bought more of them. Because of their poor quality for long-term ownership and use, this has often been a disaster (see Global Hawk and the Exoatmospheric Kill Vehicle, as examples). Next up on the quality hierarchy are assembled items that focus on one or two key performance parameters that we do want in larger quantities, but where we are willing to sacrifice some aspects of quality in order to have an important operational capability fast, usually for operational reasons or maybe because we’ve been surprised by a threat. Think Mine-Resistant Ambush Protected MRAP (vehicles), which were pulled together from existing automotive components. The goal was to get more protection to the field and to get it fast. MRAPs were a big success. We saved a lot of lives. MRAPs are relatively simple designs assembled from existing components and designed for low-end threats. They lack a lot of the features needed or desired by the Army, however, and almost all of the 30,000 or so we built are going out of the inventory now that the major counterinsurgency campaigns are over. Next on the quality scale are new designs that take into account all the things the customer wants. These are high-quality products, and they take longer, but that’s because we ask for more of them and have to do more work designing, building and testing. We want integrated designs that have many features desired by the customer (again requirements). Think of the Joint Light Tactical Vehicle (JLTV). The JLTV is a much higher-quality product than any of the MRAPs. It will be in the Army inventory for decades, and most of the cost will be in maintenance and sustainment. The Army wants a highly reliable, maintainable design that will operate in a wide variety of terrain and in any climate. This is very different from what we did with MRAPs. JLTV is still a relatively simple design, but it has taken several years to mature the designs and pick a winner. For most of these systems, we do use the standard acquisition system milestones associated with decisions to start risk reduction (if needed), design for production and production itself. When the acquisition system’s set of milestone decisions is needed, we do this in parallel with the actual work so we don’t slow programs down. The decision process adds overhead, but it generally does not add time. Highest of all in terms of quality are systems like the F-35 fighter jet. These are designs that integrate the newest technology, have the highest possible performance, and that we count on for a significant, decades-long military advantage. We want quality features like high reliability, maintainability, upgradability for tech insertion, well-designed user interfaces, cybersecurity, anti-tamper, resilience against jamming and responsive threats, and a host of other things our operators understandably desire. These systems are the Formula 1 race cars that are going to win against the best there is and do so for years, not just for one racing season. They are not Chevies. These are our highest quality and most difficult products, but these are also the ones that often make the most difference in terms of technological superiority and operational dominance. They take several years in development, and often we need to do a risk-reduction technology maturation phase before we start designing for production. That adds 3 years or more if we build risk reduction prototypes before we start designing for production. For these systems, you do have to wait about 10 years, but they are what populates most of our force. Think F-18 combat jet, Aegis missile defense, DDG-51 destroyer, the Virginia SSN submarine, F-15 and F-22 fighter jets, C-17 military transport aircraft, AMRAAM air-to-air missile, Abrams tank, Bradley fighting vehicle, Patriot missile, and Apache helicopter. Notably, every one of these high-quality systems struggled to get through development and into production. Most were close to cancellation at some time in their development cycles. The acquisition system can produce experimental prototypes quickly, but if our customers want a high-quality product that we will have in the inventory in large numbers for a lot of years, that takes longer. Many of the demonstrations we have funded in the budget are experimental early prototypes. We are effectively buying options to do lower risk follow-on Engineering and Manufacturing Development phases leading to production. The ability to afford those follow-on programs, or even a subset of the concepts we will have demonstrated in the next few years, will be problematic. Unfortunately, the threats we are most worried about are not low-end threats — we are going to need high-quality robust designs. Amid the awards and decorations on display in the Pentagon office of Ashton B. Carter, the departing deputy secretary of defense, is a metal bearing, larger than a golf ball, which wears the scars of battle. If the signature weapon of tenacious insurgents over the past decade-plus of wars in Afghanistan and Iraq was the improvised roadway explosive, then the signature weapon of the American response was the Mine-Resistant Ambush-Protected vehicle, or MRAP. The ball bearing so prized by Mr. Carter came from one of the vehicles, easily recognizable by their angular shape, to deflect blast, and outsize outside armor. 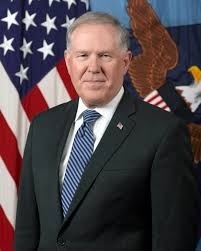 First as the Pentagon’s under secretary for acquisition, technology and logistics, and then as the department’s deputy, Mr. Carter played a central role in the initiative to rush MRAPs to Afghanistan for the troop surge, circumventing the calcified procurement system that traditionally takes years to move a weapon from idea to the front lines. A U.S. House of Representatives panel has preserved funding to refurbish Humvees despite an Army request to shift some of the money to pay for more urgent needs. The House Armed Services Committee, headed by Rep. Howard “Buck” McKeon, R-Calif., denied the service’s request to transfer $171 million from a program to refurbish, or re-capitalize, the iconic four-wheel drive High Mobility Multi-purposed Wheeled Vehicle, or HMMWV, known as Humvee and made by AM General LLC, based in South Bend, Ind.